Can a city be mindful? According to World Economic Forum it can. They have created a chart based on analysis of various databases including the World Bank's World Development Indicators, the UN World Happiness Report, OECD's Better Life Index, The Economist's Economist Intelligence Unit’s Most Liveable Cities, the Global Footprint Network and a Gallup World Poll, where we find Aarhus at the very top! Can cities be mindful? Given the bricks and mortar of the urban environment – not to mention noise and overcrowding – you might think the answer is no. But according to some authors, you’d be wrong. In her book Mindful London: How to Find Calm and Contentment in the Chaos of the City, Tessa Watt suggests that cities can indeed be mindful. More than that, they can significantly contribute to the well-being of their citizens by inspiring and enabling mindful practices. While some cities can overstimulate our senses and make it challenging to focus and pay attention, others provide peaceful and contemplative places to retreat to, whether it’s the silence and sanctuary of libraries, museums and churches or green spaces and waterways. Why is that? Why do some cities seem to have a stronger sense of compassion towards their inhabitants – as well as a higher level of resilience against the more challenging aspects of the typical urban environment? To better understand how cities affect our frame of mind, we have to ask some key questions. Firstly, what does being mindful actually mean? According to Jon Kabat-Zinn, Professor of Medicine Emeritus at the University of Massachusetts Medical School, it's the ability to master “moment-to-moment non-judgemental awareness, cultivated by paying attention in a specific way”. When it comes to attaining this heightened awareness, the urban environment can act as either enabler or obstacle. Secondly, what would be the ideal environment for a person to practise such awareness? Since mindfulness requires spaces conducive to calmness, clarity and concentration, these need to be available and easily accessible. Thirdly, what are the key measurable factors that contribute to a more mindful urban environment? Working systematically, the Infrastructure and Urban Development team at the World Economic Forum have been able to define some of these factors, which we’ve divided into what we call “leading” and “lagging” indicators. Leading indicators are pre-existing things that contribute to mindfulness, such as low levels of noise and pollution. Lagging indicators, on the other hand, can be measured as a long-term result of a more mindful lifestyle, such as lower stress levels or increased well-being or happiness. 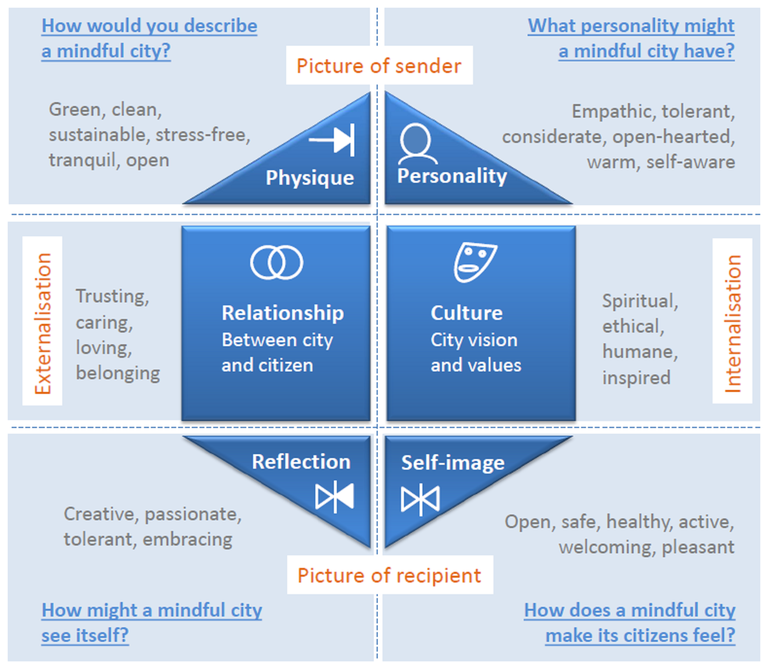 In order to systematically analyse and categorize the attributes of a mindful city, brand strategist and author Jean-Noël Kapferer developed this identity prism. It provides a robust framework for how a city can create a resilient physique, personality, culture and relationship with its citizens, all of which amount to a more mindful environment. Fourthly, which factors might make exercising mindfulness a challenge – or even impossible? On a global level, the spread of urbanization has led to a rise in the number of stress-related diseases. According to the World Health Organization, mental health issues caused by city living will be a major burden in urbanized countries by 2030. So which cities are getting it right? We’ve put together a list of the most mindful cities, based on analysis of various databases including the World Bank’s World Development Indicators, the UN World Happiness Report, OECD Better Life Index, the Economist Intelligence Unit’s Most Liveable Cities, the Global Footprint Network and a Gallup World Poll. The ranking analyses various attributes, such as social tolerance, civic engagement, work-life balance, quality of healthcare, life expectancy, safety, ecological footprint and income levels. Scandinavian cities dominate the top of this chart, perhaps unsurprisingly. But it’s Denmark’s Aarhus – a big city surrounded by natural beauty, with ambitions to become CO2 neutral by 2030 – that wins top billing.